This report describes the nature of foamed concrete, its composition and properties and how it could be specified for use in civil engineering works. Because the properties of foamed concrete can vary widely, and it can be used in a wide variety of applications, it is important to define performance requirements for each case. Current usage in the UK of foamed concrete is of the order of 250,000 tonnes per year Despite this fairly significant tonnage there is, as yet, no definitive guidance on how the material should be tested and specified for use. Furthermore there is a paucity of information on some of its properties, particularly regarding its long-term performance. This situation might be restricting the wider use of foamed concrete for ground engineering and structural applications. The report provides a brief history of the development of foamed concrete and gives examples of contemporary uses. The quality control tests that might be applied to foamed concrete are described; some of these differ from those used for normal weight concrete. 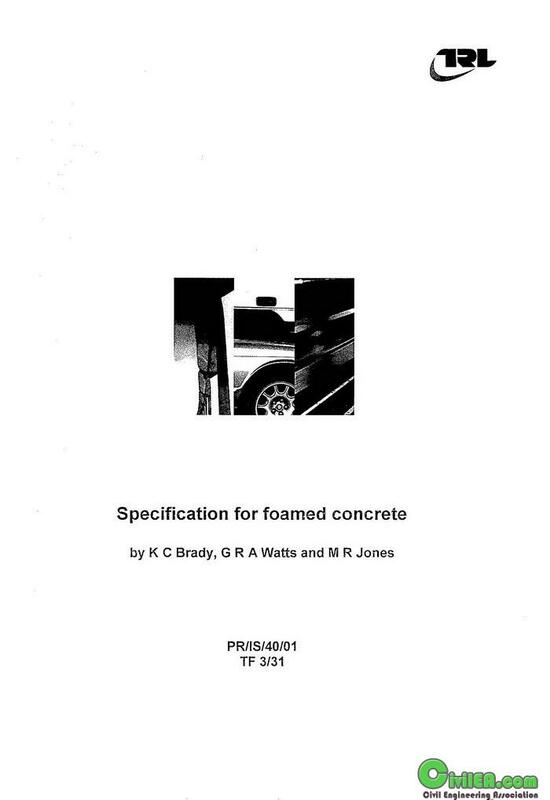 An example specification for foamed concrete is provided, which includes both mandatory and optional requirements. Distinction is made between clauses for use with all applications and those required for specific applications. Guidance on acceptance criteria and actions to be taken in the event of non-conformance is also provided.